Tuesday Plan: I will be focusing on FOMC Interest Rate announcement, as it is one of the most volatile events. My plan is actually to wait for the announcement and try to decipher the statement. Therefore, if FOMC is hawkish, I will sell EUR/USD and BUY GBP/JPY, if FOMC is dovish, I will buy EUR/USD. 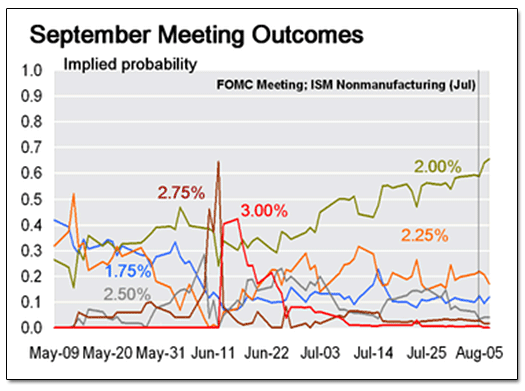 It shows that the upcoming September Rate decision, at present moment, has a 65% chance of 2.00% (unchanged), and 20% for 2.25% (hike), 10% for 1.75% (cut). Result: FOMC decided to leave rates unchanged as expected. Accompanied statement was not extremely hawkish, lots of uncertainty and therefore no trade. Future outlook on the US Dollar is still moderate bullish for the time being.